The USGS (http://waterdata.usgs.gov/nwis/rt) also provides internet real-time water temperature readings in degrees C (in addition to discharge flow and stage height data) for a limited number of Lake Erie tributary streams, including the Rocky River in Ohio and Walnut Creek in Pennsylvania. Observing fluctuating water temperatures is not only vital for locating the bulk of steelhead in a tributary through the fall, winter and spring seasons, but also for monitoring steelhead holding locations (as well as movements) on a daily basis. It can also influence the technique and flies the steelheader chooses to use for that particular day on the water. As the seasons and tributary temperatures change, steelhead seek current breaks that they can comfortably hold and rest in depending on the water temperature. This behavior is directly related to the fact that steelhead are a cold-blooded species and their metabolism decreases as water temperatures fall. As this occurs, steelhead become less active and more lethargic and will lose their ability to hold in faster currents. Targeting early fall steelhead along the shoreline (when the lake is flat) and at the tributary mouths can result in some fantastic fishing that few steelhead fly fishers take advantage of (either from shore, small boats and even belly boats). These lakeshore fish are the legendary fall “chrome bullets” and can be readily caught stripping streamers and wooly buggers with sink tip lines and shooting heads. Fall steelhead begin running in large numbers into the tributaries when cool fall rains bring substantial tributary run-off and night time air temperatures start to drop (cooling the tributaries). Prior to fall run-off, the tributaries are typically low and clear and extremely warm from the summer heat. Fall tributary temperatures in September and October, although cooling to the 45 degrees F + range, maintain the metabolism of fall, lake-run steelhead encouraging them to hold in faster water like pool heads (including the pool lip), fast runs and chutes, lower pool tail-out’s (moderate current) and fast pocket water. Relatively warm tributary flows also make fall steelhead aggressive, hard-hitting fly takers. 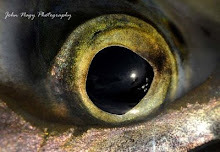 They will move out their way to take a dead-drifted egg pattern, nymph or small streamer and actively chase a swung wooly bugger, streamer, spey or tube fly. Energized fall steelhead can move great distances up a tributary especially with good run-off. Low water conditions along with abrasive, shale bottom streambeds (which can be physically rough on migrating steelhead) tend to slow upstream steelhead movement. Winter water temperatures (December-February/32-37 degrees F) locate more lethargic steelhead into resting areas along shale ledges in deep, slow moving pools (look for current “seam” in water surface which indicates shale ledge below) as well as slower runs, pool back-eddies and the classic winter holding location of the upper pool tail-out of a deep sloping pool (very slow current). Ice water tributary flows shrink the “bite-zone” around a steelhead (they rarely move much for a fly) and seems to give them a case of “lock-jaw”, resulting in rather uncooperative fly takers. When they do bite, the takes are often soft and imperceptible to the rookie steelheader. Steelheaders looking for more hook-ups with finicky winter steelhead should try multiple presentations (you literally have to put fly on the noses of the fish), subtle rig adjustments (tippet size, shot amount) and numerous fly changes, including sizes down to #16’s for egg and nymph patterns. Steelhead movement in the winter occurs during periodic episodes of gradually increasing tributary temperatures to the upper 30’s degree F. The actual movement is slow, with fish methodically working their way to the upper half of the tributaries (during periodic thaw periods) where good spawning gravel exists. Consistently rising tributary temperatures (into the 40-58 degree F range) and longer photo-periods in late winter and early spring (March-May) activate steelhead (many of which have wintered over) to move onto spawning gravel. After spawning, the tribs will hold the voracious eating “drop-back” steelhead until they get too warm (May-June/high 60’s and above) at which point steelhead head to the Lake Erie shoreline. It is not advisable to fly fish for drop-back’s when the tributaries reach water temperatures of high 60’s and above since playing fish under these conditions can stress fish to the point of mortality. Spring ice-out along the Lake Erie shoreline (which usually occurs from early to mid-March) initiates fresh runs of steelhead from the lake. In Pennsylvania and New York, these fresh runs are about 25% of the total number steelhead running for that year. 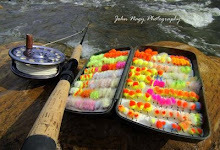 In Ohio the spring running Little Manistee strain steelhead encompasses the majority of steelhead running for the year. 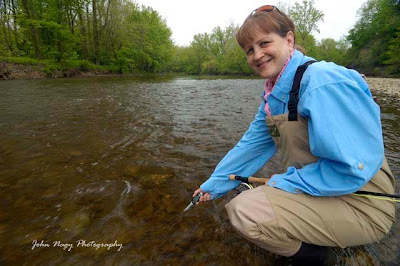 Although good numbers of stray steelhead from Pennsylvania (and a direct stocking of Pennsylvania fall/winter strain fish into Conneaut Creek) contribute to the Ohio steelhead runs. Through all these seasons, there are transition temperatures that occur between the fall, winter and spring seasons that locate steelhead between the classic seasonal holding areas. Fall-winter holding steelhead (October-November/38-45 degrees F range) avoid holding in very fast water, and can be found instead in the middle sections of pools, moderate runs and slower pocket water flows. Pre-spawn steelhead (March-April/suddenly dropping or increasing tributary temperatures above or below the ideal spawning range of 40-58 degrees F) stage in holding areas adjacent to spawning beds in nearby runs, pools, pocket water and bank under-cuts. During the course of a day, water temperatures are typically coldest in the morning, making steelhead less aggressive and more prone to take a dead-drifted fly in moderate to slower flows. Warming temperatures into the afternoon move steelhead into faster runs and pools where actively swinging flies in the traditional down-and-across manner can be very effective to energized fish. Late fall steelhead are still fairly active and aggressive but unusual cold snaps that drop tributary temperatures 4 or 5 degrees F or more can put a damper on an aggressive steelhead bite. This forces the fly fisherman to look for steelhead in more fall-winter (and even winter) type locations and slow down his or her presentation. In the winter, mid-day to early afternoon is typically when the warmest water temperatures (and active steelhead) will exist, even though only a few degree increase in water temperature has occurred from the frigid water temperatures of morning. If you forget your thermometer on a winter steelheading trip there is a way to roughly determine the water temperature based on observing how a steelhead fights after being hooked. Winter steelhead don’t fight much and will rarely break water. If a thaw occurs during the course of the day, causing gradually increasing water temperatures, a winter steelhead (after being hooked) becomes active enough to make that first jump when the water temperature hits the 40 degree F mark. 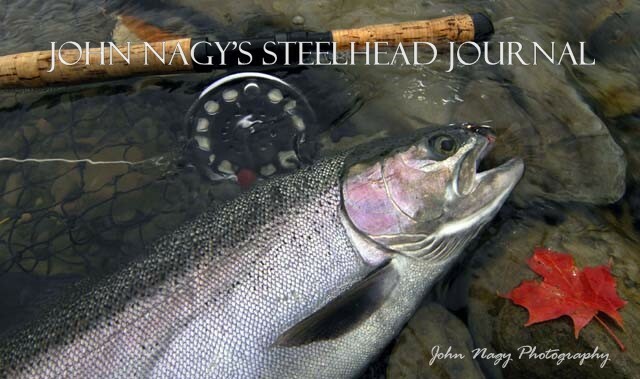 More detailed information on fly fishing for Great Lakes steelhead can be found in John Nagy's book "Steelhead Guide, Fly Fishing Techniques and Strategies for Lake Erie Steelhead".